Adelaide Festival originated from a cross between Pink Berkeley Tie Dye and Rosella Purple made by Patrina Nuske Small in 2009 named Tidy F1. Adelaide Festival was selected andnamed by Patrina after the fireworks celebrating the Adelaide Festival of Arts in her home city. 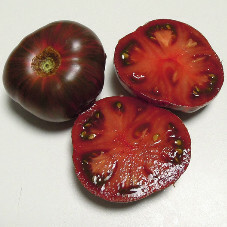 It is a mid-season regular leaf variety, yielding rich purple tomatoes with green vertical stripes that ripen to olive-gold. The fruits are medium-large oblate weighing180 -300g/ 6-10oz, very juicy and tender with delicious well balanced flavour. Plants have sturdy stems, robust rugose foliage, and reach approximately a metre/ 3 ft tall requiring support due to the weight of tomatoes.